"Their World Is Closer Than You Think"
A woman with her three teenage children leave the big city life to begin a life of rural living. The house comes in gratitude to a family inheritance, a marital separation, and a need to cut back on expenses. The house is the Spiderwick estate which is packed full of surprises which Jared (Freddie Highmore) soon discovers. The paranormal often is viewed as lunacy. A fate which left his great aunt institutionalized. Jared’s curiosity sets in motion a fantasy tale that will unite them with the fairy world in a battle against the trolls. Of the three children, Jared had the closest relationship with his dad. The rivalry that exists between Jared and his twin brother, Simon (also played by Freddie Highmore) and sister, Mallory (Sarah Bolger) sets the tone for the movie. This fairy tale world adds friction between siblings and mom. The entire family becomes awakened to a world of fairies, trolls, griffons, and brownies. Jared's discovers a hidden chronicle. This chronicle becomes the centerpiece of this battle. The trolls wants it. With this chronicle the trolls can rule the world. The rest of the supernatural world wishes to keep this chronicle out of the hands of the trolls. Jared’s rebellious nature places the world at peril. The trolls have obtained a piece of the chronicle. Though only a piece; it is enough. It provides the knowledge that allows them to break a spell. A spell that has kept them away from the estate and the chronicle for over 80 years. Will the world fall into the hands of the trolls? Jared, Simon, Mallory and their Mother all were disbelievers to the fairy world. Now as believers they are faced as a key piece to winning this battle. It is up to Jared. He holds the knowledge. The secrets of the Chronicle. As they prepare to battle you have to ask. Can they keep the chronicle out of the hands of the top troll, the Mulgarath? The story of the Spiderwick Chronicles offers a tale of adolescents facing life's struggles. How words in anger may come out. Words that are spoken. Words that we may later regret. Words that often hurt the ones we love. 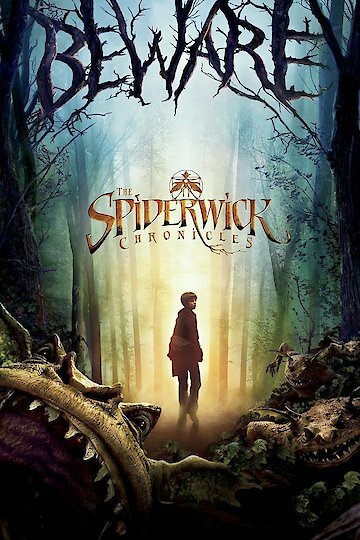 The Spiderwick Chronicles is a 96 minute adventure, fantasy, and family movie that is rated PG. The movie is based upon the book by the smae name written by Tony DiTerlizzi. The Spiderwick Chronicles is currently available to watch and stream, download, buy on demand at Netflix, Amazon, Vudu, Google Play, FandangoNow, iTunes, YouTube VOD online.